The twelfth session (Monsoon Session 2017) of the 16th Lok Sabha was held between 17th July 2017 and 11th August 2017. During the 19 sittings of the twelfth session, the Lok Sabha conducted business for 76 hours and 41 minutes. During this Session, the Lok Sabha lost 29 hours and 57 minutes due to interruptions and forced adjournments. However, the Lok Sabha sat late for 10 hours and 36 minutes to complete the business. During this session, 17 Bills were introduced and 14 Bills were passed. 281 matters were raised under Rule 377 and 252 matters during ‘Zero Hour’. 382 Starred Questions and 4370 Unstarred Questions were admitted during this Session. 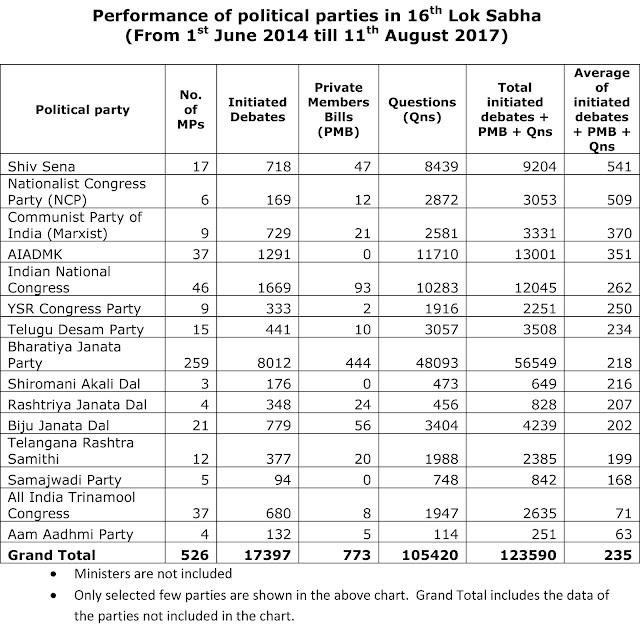 The 16th Lok Sabha started their business on 1st June 2014. Till 11th August 2017, 245 sittings were held in 12 sessions. 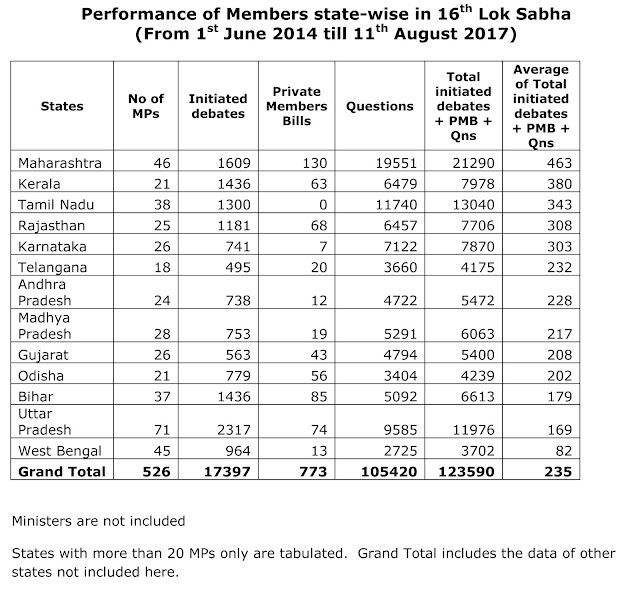 PreSense analyses the cumulative performance of Members from the first session to the twelfth session. 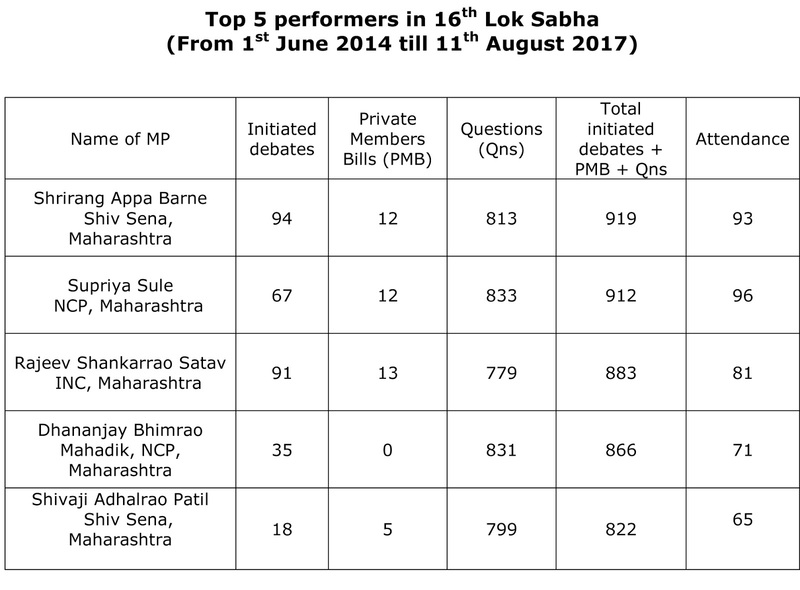 Shri Shrirang Appa Barne, Shiv Sena MP from Maharashtra has been maintaining the first position every year since the beginning. He has been receiving Sansad Ratna Awards for the past three years. As readers are aware, the Sansad Ratna Awards was instituted by this ezine PreSense in 2010. Shri Rajeev Shankarrao Satav (Cong), Shri Dhananjay Bhimarao Mahadik (NCP) and Shri Shivaji Adhalrao Patil (SS) were also recipients of the Sansad Ratna Awards in the past. 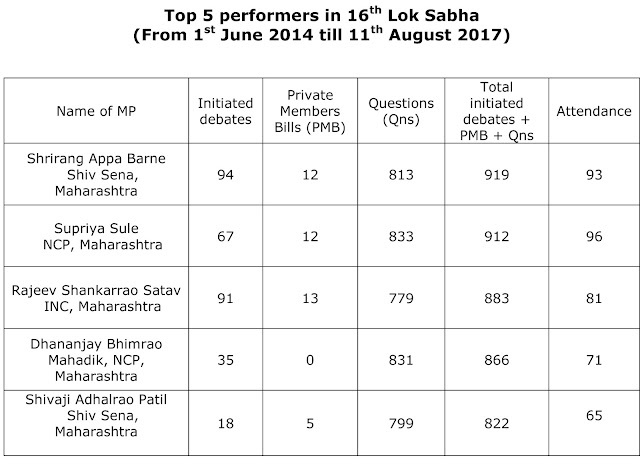 It may be noted that all the top 5 performers are from Maharashtra. The National Average of Debates, Private Members Bills and Questions is 235 till the end of twelfth session. Only 5 major states are above national average. Many states are below the national average. 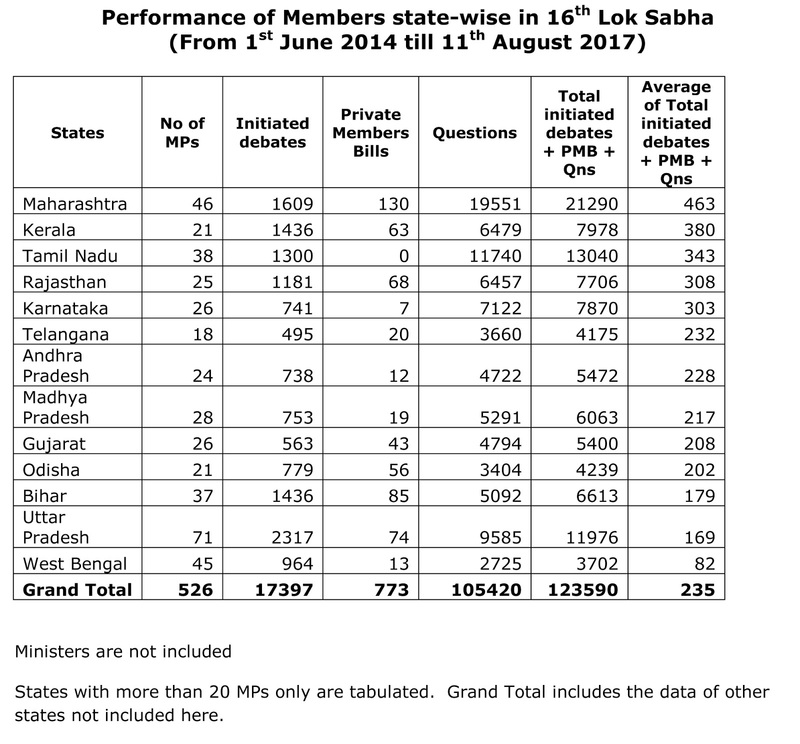 The performance of Maharashtra, Kerala, Tamil Nadu, Rajasthan and Karnataka improved. West Bengal has been consistently showing poor performance. (West Bengal’s average 82 compared to national average of 235). Shiv Sena and Nationalist Congress Party (NCP) are doing extremely well with less number of members. This has helped Maharashtra to gain the first position among all states. Trinamool Congress and Aam Aadmi Party have shown extremely poor performance in the 16th Lok Sabha. The poor performance of Trinamool Congress with 37 members has pulled down the performance of West Bengal. With only 61 members, the women members, as a group, compare well with their male counterparts. Some popular film stars and sports persons were nominated by the ruling parties to contest in the Lok Sabha elections, or as members in Rajya Sabha. These celebrities enjoy the perquisites and the privileges of Members of Parliament. Among the celebrities, Kirti Azad and Hema Malini perform well. A time has come to review and reconsider celebrity nominations to parliament based on their performance. While the celebs are nominated at the cost of public money, they are deviating from their main duty of representing the people’s cause. Besides being poor performers, celebrities such as Sachin Tendulkar and Rekha scarcely attend the Rajya Sabha Sessions. The ruling Government should analyse the individual performance of celebrities and stop nominating them to Parliament, wasting the public money.